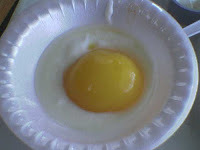 If you feel that your morning is so dragging, try to add in your breakfast favoritesthe menu of yogurt and eggs. This little diet tweak could help you forget you even have a snooze button, because of the extra dose of tyrosine -- a building block for two important wake-up-your-brain chemicals. It helps make the wake-up brain chemicals dopamine and norepinephrine. In addition to eggs and yogurt, other food sources of tyrosine include almonds, chicken, avocados, bananas, and sesame seeds.